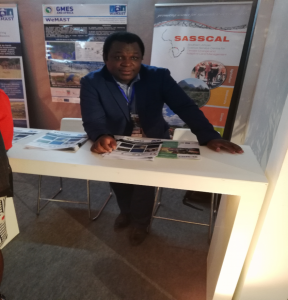 SANSA is participating the First Forum of the Global Monitoring for Environment and Security and Africa (GMES and Africa) from 19 -23 November in Libreville, Gabon. The theme of the forum is “Unlocking the Potential of Earth Observation as a Key Driver of Africa’s Sustainable Development.” The themes covered in the current forum include a focus on marine and coastal resources, water and natural resources, service development and delivery, data and infrastructure, training, research and development, resource mobilisation, collaborations and partnerships. GMES and Africa is a result of a long-standing partnership between the African and European Union Commissions in space science and technology. SANSA is a partner in two GMES and Africa funded projects looking at the monitoring of wetlands and rangelands in Southern Africa. The GMES and Africa projects are aimed at promoting the development of local capacities, institutional, human and technical resources for access to and exploitation of EO-based services. The Wetlands Monitoring and Assessment Service for Transboundary Basins in Southern Africa (WeMAST) consortium is constituted by partners that include SASSCAL in Namibia, University of Botswana in Botswana, Cape Peninsula University of Technology in South Africa, Midlands State University in Zimbabwe, National Remote Sensing Centre (NRSC) in Zambia, SANSA in South Africa, University of Western Cape in South Africa and the University of Zambia in Zambia. The WeMAST project will provide products and services for the management of wetlands in the Limpopo, Zambezi, Okavango and Cuvelai transboundary basins. Online based products and services that the WeMAST project includes are; wetlands inventory, information on water cycle regimes, and information on vegetation dynamics, inland water quality, wetland utilisation and land cover information. Countries that stand to benefit from the services include South Africa, Namibia, Botswana, Zimbabwe, Zambia, Angola, Tanzania, Malawi and Mozambique.